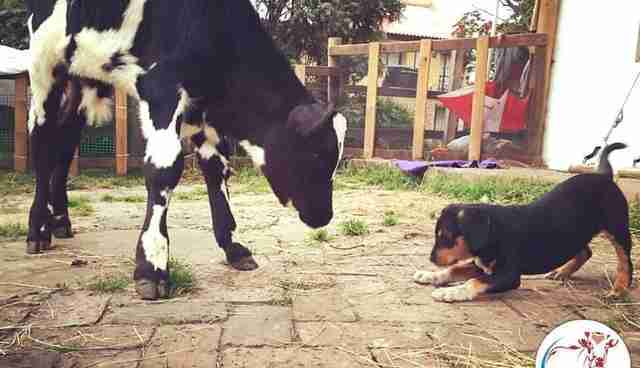 The first thing you'd probably notice about Bernie, a baby cow, and Sri Ram, his puppy, is their size difference. Ironically, Sri Ram is the older of the two - he's 5 months old, while Bernie is only 3 months. 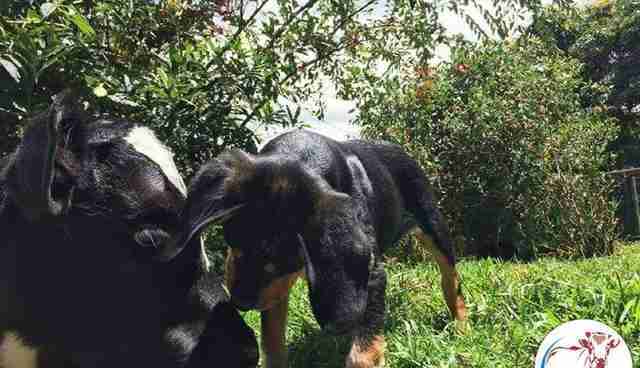 The two rescued animals live at Juliana's Animal Sanctuary (JAS) in Colombia, where they've become the best of friends. Sri Ram joined the sanctuary first, in April, Juliana Castañeda Turner, founder of the sanctuary, told The Dodo. Castañeda had been out recording areas close the sanctuary, taking note of the number of abandoned dogs that roamed the area. 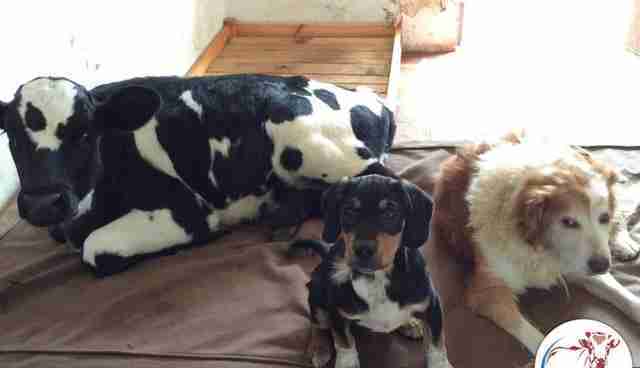 She came across four puppies seemingly on their own, drinking milk from bowls. 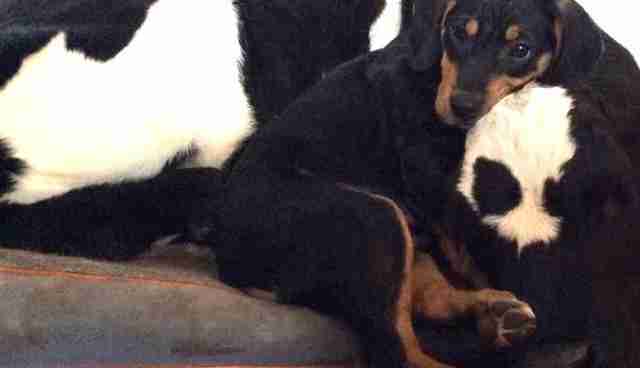 But after a long day of work, she didn't think she'd be able to stage a rescue - so she left them as they were. 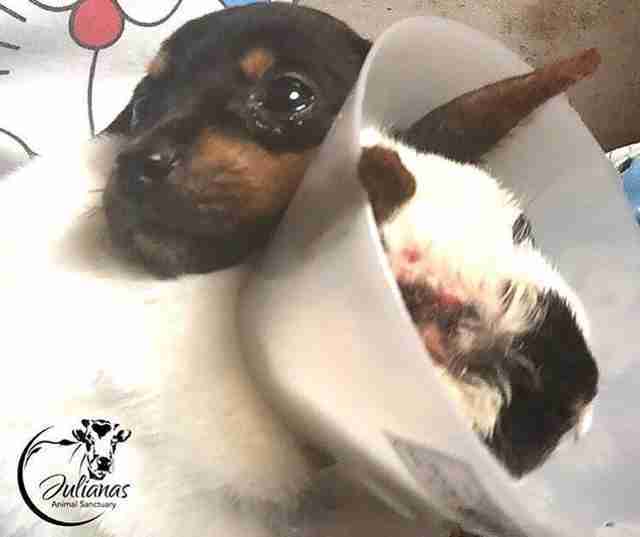 That night, Castañeda was unable to sleep as she kept thinking about the puppies, and ended up pulling herself out of bed at 5 a.m. to visit the location where she first saw them. Castañeda found the puppies again, and tracked down where they lived. 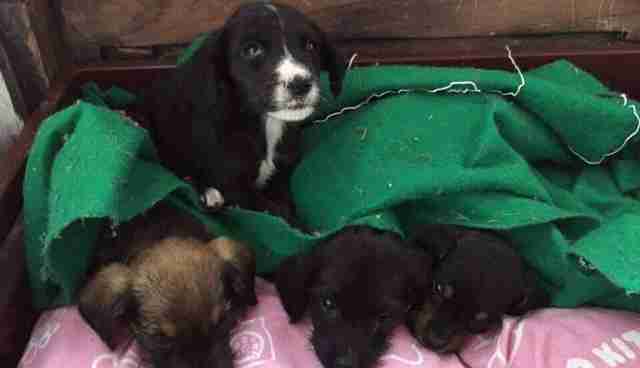 According to Castañeda, their owner had many dogs and didn't particularly care about their conditions - one of the puppies had previously died, she was told - so she volunteered to take the remaining four puppies, including Sri Ram, into her care. 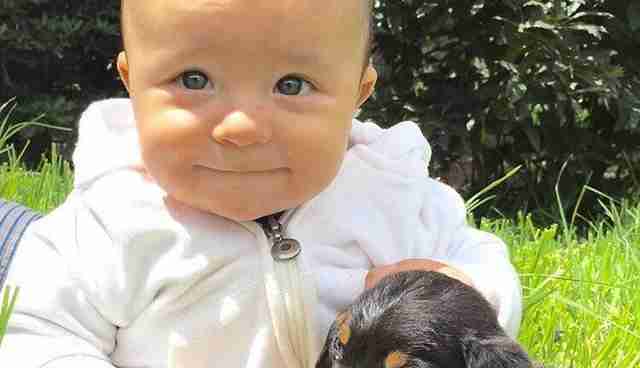 "In May I had to travel to the U.S. and I took with me three of the puppies, all that I could, and they found their forever homes," Castañeda said. Sri Ram was the sole puppy left behind. Bernie started life out on a dairy farm. 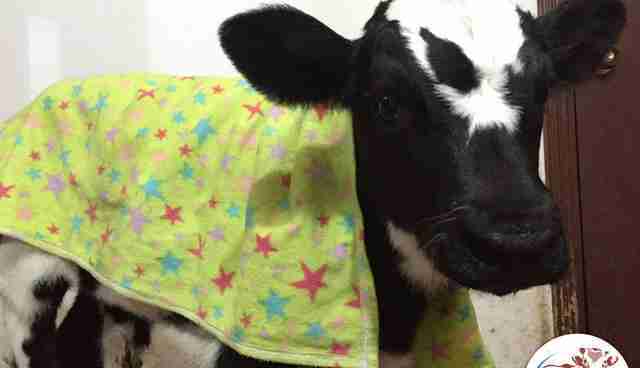 As a male calf, he was unwanted, so his previous owners tried to sell him off. 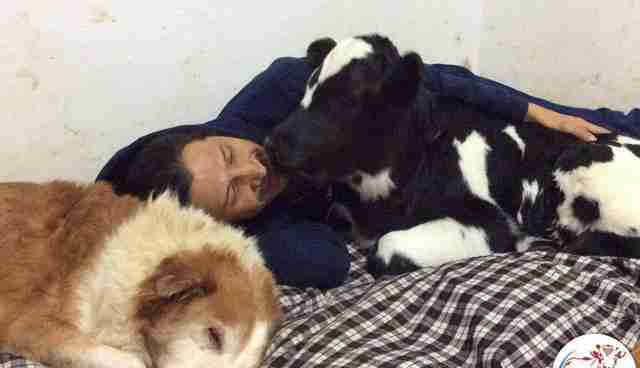 However, when they realized that he would likely be put up for slaughter if given to a farmer, they tried to find another home for the 12-day-old calf. 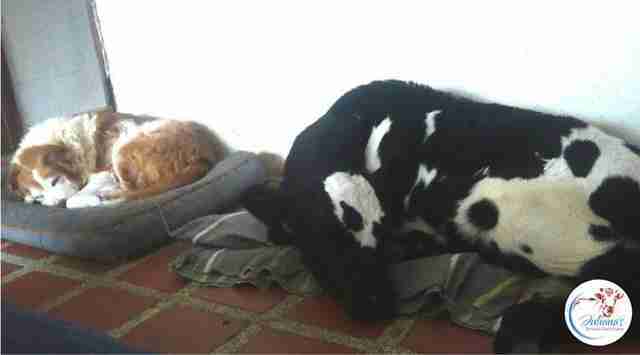 He was dropped off at a local animal shelter, which contacted Castañeda. She decided to give him the home he needed. Bernie and Sri Ram weren't aware of each other's existences for a while, as they were kept in separate areas of the sanctuary, but that was about to change. Sri Ram was lonely, so, one day, he was placed in the area of the sanctuary where older dogs live - and that's where he ran into baby Bernie, who also sought the company of the elderly dogs. old dogs who don't play ... [they don't have] the same energy." The two now love playing together nonstop and, when they're all tired out, there's nowhere they'd rather be during nap time than by each other's side. Sri Ram especially likes to give Bernie kisses on the face. Even better, the two will continue to grow up together - and spend the rest of their lives at the sanctuary as best friends. As far as the duo is concerned, there are no differences between them. "Bernie thinks he is a big dog and Sri Ram think Bernie is a big dog," Castañeda said.